Customized Eco-Grocery Tote Bag Just $1! You are here: Home / Great Deals / Customized Eco-Grocery Tote Bag Just $1! Here’s a great deal on a customized tote bag! 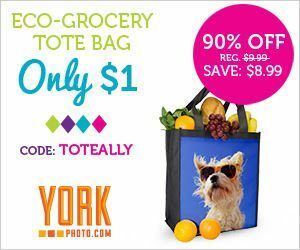 Head over to YorkPhoto.com and get an Eco-Grocery Tote Bag for just $1! Enter promo code TOTEALLY at checkout and pay just $3.99 shipping. This would make a great teacher appreciation gift, too!